What a crazy game that was last night...talking about the Red Sox. And Sunday's game too! Not to mention the Patriots game. ( I'm setting myself up for the reason I'm late with my column this week). The Patriots and the Red Sox messed me up. But it was good. The Patriots hold the record for 20 consecutive wins that may never be broken in our lifetime. The Red Sox are coming back from a 3-0 series that looked all but over after Saturday...but here it is Tuesday and things are looking pretty good. Don't know how many of you are sports fans, but I'm guessing it's quite a few. I do wish for all you TRUE Sox fans that they win a World Series one of these days and they win it convincingly. Ok I want to thank all of you who came out on a Sunday Night to see the Premiere of my latest movie 13POINT5. It was a good turnout for the most part and I am thankful for those who were there. I mentioned last week that I was going to talk about the local Surf Movie Scene. Far as I know, there are only a few of us who do this and do it seriously. Myself, Joe Carter, those guys from Vermont, Jack Fleming, John Savastano and some of the younger guys like Alex Orestis and Lars Jacobsen. In the old days (1970's) it was myself and Ron Freeman who lived in Ogunquit. We made movies using Super8mm and 16mm movie film. It was very primitive compared to what we do today. It was time consuming and very expensive. There was little room for error in those days. You can't record over film. I still like the quality of film. I like the texture and apparently so do a lot of the bigger name surf movie makers. I've seen quite a few releases in the last few years that were released in a 16mm format. I guess it's trendy. I'm not knocking the DV camcorders. Hardly, especially the editing software that's available today. It's all much quicker today. Like anything else though. All the latest software and cameras will not make you a good filmmaker. You still need the eye and knowledge of the subject you're shooting. I think I have it down. I'm also at the crossroads in my surfing life where I have just as much fun shooting the surf as I do surfing. (Please remember that the next time you find yourself beside me paddling for the same wave). Being a musician helps too. Music is key to any good surf movie. 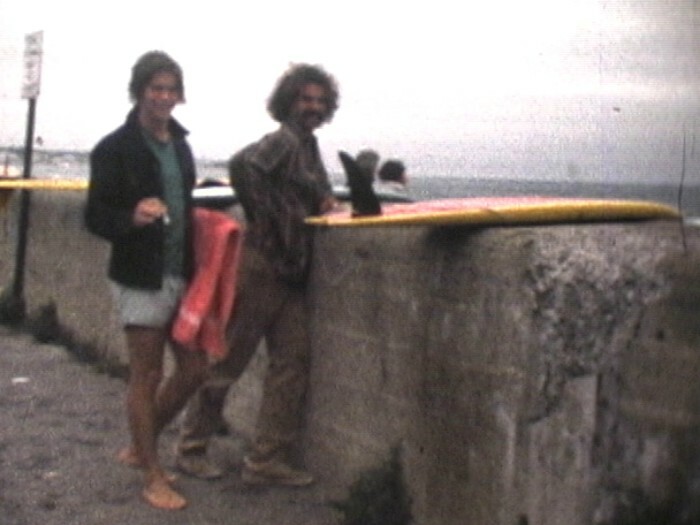 This was just another day surfing at the Wall in the 70's. That's a young Kevin Grondin on the left and the late Joe Somgyi on the right. That's my old board laying on the Wall. It was a 7' 2" Swallow tail with a huge single fin. NOMAD Surfboards made in Florida by Ric Aho. We all rode those semi-guns in the early 70's. We were all trying to be Gerry Lopez in those days. Like the kids today all trying to be Kelly Slater and Andy Irons. It's all good. Just make sure they are NOT huge files. In fact if you have any questions about the size, email me first and I'll write back. Start snapping your buds!! An older Kevin Grondin banks out onto the flat of these perfectly groomed wave. Kevin's next move was to pull up into the pitching lip and get covered for his efforts. What a difference 3o years makes. Surf movies are a passion for a lot of us. I admit I have a soft spot for shooting empty waves. Or more specifically, perfect empty waves. I love the look of a wave with no one on it. There's something about looking at the mechanics of a perfect wave that I find truly mesmerizing. Besides, empty waves do NOT rob you of your imagination. What do I mean by that? Simple. When you look at a photo in a magazine of someone surfing, your eye is trained to look at the action. Whereas if you're looking at an empty wave. Your imagination takes you where ever you want to be on that particular wave. That's the reason all my wave paintings are empty. 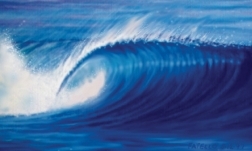 I want the viewer to be able to look at one of my waves and activate their imagination. One of these days I plan on doing a movie with nothing but empty waves. And yes, I know I'll have a limited audience for such a project. But to those of you who truly appreciate an empty wave, it will be a feast for your eyes. Because I have so much footage of empty perfection. I'd call it "EMPTY WAVES". Meanwhile, 13POINT5 went over pretty good. The surfing was good to REAL Good and it featured a lot of the area's best Surfers as well as some visiting Pros. It's nice to see the big boys come to town and take advantage of our incredible surf. There's one scene in 13POINT5 when Benji Weatherly (Pro Surfer) says; "We didn't think there would be surf in New Hampshire." SFOD will release both 13POINT5 and the New SFOD Grom Video MONKEY PUNK on Veteran's Day (November 11th) and they will be available at all the shops and online www.surffreeordie.com They will be released on both DVD and video. I'm also releasing my other movies on DVD. What are those movies Ralph you ask? Why they are: 99 to 90, THE WALL 2000-2001, SURFING THE SOUL 2002, GROMMATICALLY CORRECT, RICA RICO 2003-2004. Looks like more surf coming. And more than likely I'll be out there trying to decide whether or not I should shoot or surf. Such a dilemma. Could be worse though...could be a whole lot worse. Go RED SOX! Go PATRIOTS! For sure pop Dave McInnis would be proud to see his son slotted nicely on another New Hampshire Gem. In fact, I know he would because he was out this day surfing with Bob. Jesse is one of the many talented athletes who live in his home. Jesse's clearly one of the Hot up and coming Groms who surf every swell every day of the summer.